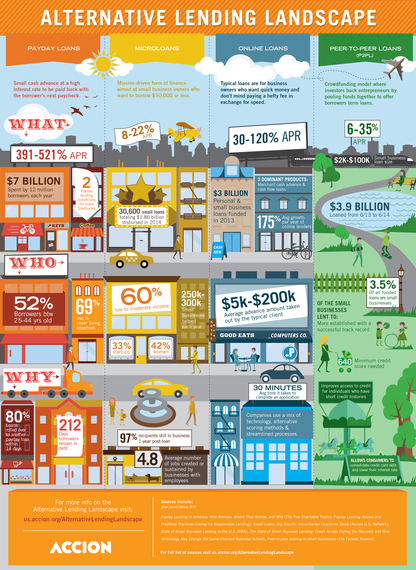 Small businesses, startups, and the self-employed have never had the easiest time getting financing, but most experts agree it became downright difficult following the housing bubble burst of 2007 to 2008. According to the Small Business Administration, evidence suggests small businesses were hit hard by the financial crisis that resulted, which saw credit dry up right along with the appetite for risk among the country's lenders. 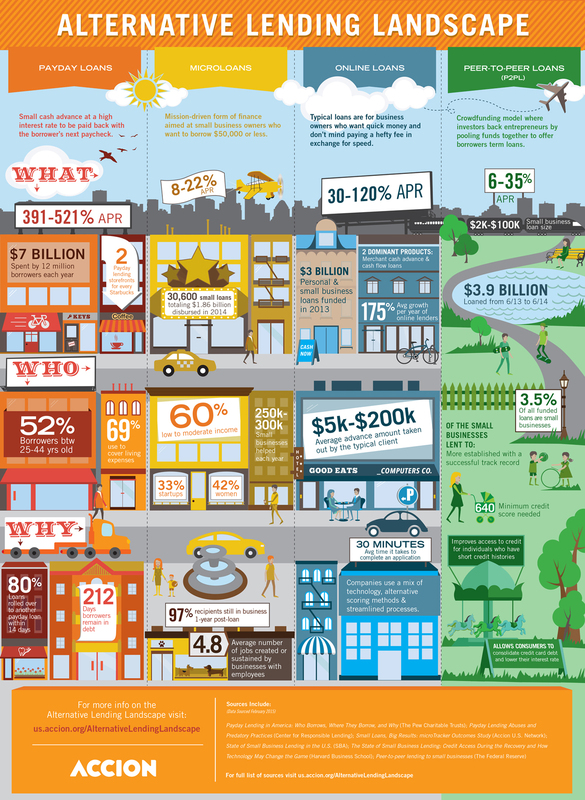 Over the past few years, a very vibrant marketplace has taken shape online to fill the void the recession created. Leveraging large technology investments, these new lenders offer business owners new financial products at lightning speed. By 2009, information technology research firm Gartner Group says just about half of us were doing at least some of our banking online, and we were getting accustomed to the speed and convenience that came with it. No longer did paying your bills have to mean writing a check and taking it to the post office. Similarly, applying for a loan is no longer defined by going to the bank, making an appointment with a loan officer, handing over piles of documentation, and waiting weeks for a decision. The ability to apply and be approved for a loan over the Internet is game changing in the financial services industry. Individuals and businesses that had difficulty being approved by traditional lenders in the past now have options from a vast array of potential funders for loans. In some cases, the loan products themselves are original, while in others, the decision-making methodology has completely changed. Having more sources of available funding is a boon for businesses, but it also requires becoming educated about the pluses and minuses of each, and exactly what you're signing on for when you apply. Take payday loans, for example. You may be familiar with them as "check cashing loans" and for people who need a small amount of cash quickly--they have long been a fast, but very expensive, solution. They've been around for a long time, but they're marketed differently now. While check cashing storefronts still abound, a good chunk of these loans are done online--with practices that may raise questions about security and confidentiality. The regulations governing these loans say you have to be employed or have a steady source of income. You're also required to have a government-issued photo ID, a checking account, and proof of address. However, this isn't necessarily the case, especially with payday lenders who ply their trade online. National Public Radio's Pam Fessler reported being inundated with offers for high-cost loans after applying through one website using a fake name, Social Security number, and bank account information. Nevertheless, she was approved for a loan of $750 that carried an APR of 1300%, which is high even by payday loan standards. Relatively speaking, this is very expensive money. 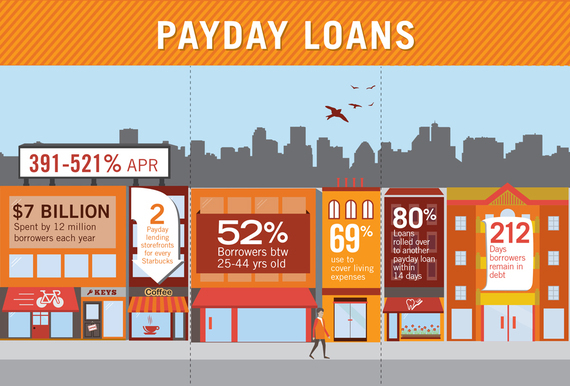 Payday loans generally carry fees or interest rates in the neighborhood of 15%, and it adds up quickly: A 15% rate (or a $15 fee) on a $100 two-week loan adds up to an APR of 390% when calculated over the year. A $30 fee has an APR of 780%. Many payday borrowers have found that while the loans are easy to get, they're a struggle to get out of, as they wind up living not just from paycheck to paycheck, but from loan to loan. 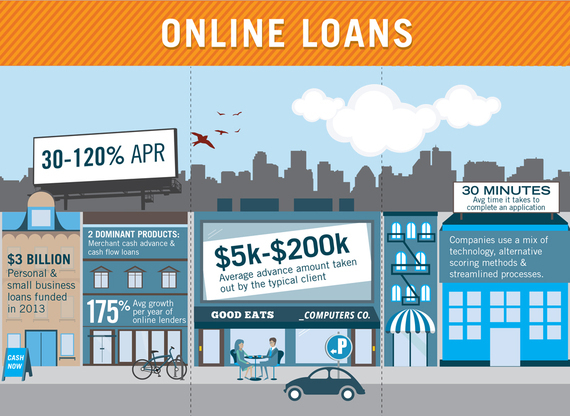 There are online alternatives besides payday lenders, especially for small business loans. And the options have continued to multiply as most banks remain reluctant to loan to startups and smaller firms. With the need not being met elsewhere, alternative lenders are filling the void. Not only have the number and types of alternative lenders increased dramatically in recent years, there's also been a meteoric rise in the amount they're lending. Forbes Magazine reports, "The outstanding portfolio balance of online lenders has grown about 175 percent a year, compared to a decline of about 3 percent in the traditional banking sector." There are two different types of online lenders: companies that make loans from their own pool of funds, and peer-to-peer lenders that match borrowers with individual lenders and other investors. Each is thriving. In 2014, two online lenders went public to great fanfare, OnDeck Capital (ONDK), a direct lender, and Lending Club (LC), a peer-to-peer lender. Google bought a stake in Lending Club in 2013 and recently announced an even larger investment in the peer-to-peer lender. Many online lenders tend to use a different model than traditional banks for making lending decisions. They rely on software that analyzes a whole range of data including a company's cash flow, payment history, customer transactions, industry trends, and even social media engagement. The application process is streamlined and done via the internet or through an app, usually in about a half hour. Decisions are often made the same day, and capital can be provided quickly. That was the experience for Horacio Ceballos when he took out a loan from CAN Capital. "I received a loan for $21,000," the health food distributor said. "No one had ever given me a loan of that size before. My company was growing and I needed to hire an employee desperately. I also needed to buy more supplies. Thanks to this loan, I was able to do all of that. And what was really great was I received the money in two to three days." Loans through online lenders are typically for short terms, usually less than nine months. As a rule, they're paid back by deducting a fixed amount or a percentage of sales directly from the borrower's bank account until the funds, fees, and interest are repaid. Depending on which lender you choose and the terms you agree to, payback can be tough. Cleaning and grocery product wholesaler Bernardo Delgado says it was hard to make the weekly payments toward the $20,000 loan he got from OnDeck. "It was really aggressive--difficult to pay. I didn't realize what that was going to feel like. I felt pressure the entire time I had that loan to pay. It was too short-term and too expensive for the amount of money I borrowed." If you're not exceedingly cautious, loans from online lenders can be tremendously costly, ranging anywhere from 30% to over 120%. Even so, online lenders are popular. Three billion dollars' worth of online loans were funded in 2013, and just this past year, CAN Capital CEO Daniel DeMeo says his company alone lent a billion dollars. Because approval for these loans is less dependent on a credit score, businesses with strong cash flow may qualify even if their payment history is a bit tarnished. Still, Delgado warns to proceed carefully. "My advice to other entrepreneurs would be to definitely think about the cost, but more importantly the term. Having time to pay off the loan in a relaxed manner makes all the difference in the world." Ceballos agrees. "Financing from CAN Capital is fast, but the daily payments are hard and at the end of the day it's expensive. The daily payments and the interest they charge really make the loan much more expensive than you initially thought." Borrowing from an online lender can be a balancing act as you juggle time, money, and resources. Only you can decide if the pluses outweigh the minuses for your business at any given time. There is yet another category of loans available for entrepreneurs and small business owners that combines the benefits of an easier application process with lower interest rates and fees. These loans are made by nonprofit organizations known as microlenders, who specialize in lending small amounts to individuals and businesses. Most microloans top out at $50,000, and while there are qualifications a borrower has to meet, generally, they're not as strict as with traditional banks. Many microlenders will require a business plan (for startups), financial statements (for established businesses), information about what the loan will be used for, and in some cases, collateral and references. Because they're generally extended to people who don't have an extensive business history or collateral, interest rates are somewhat higher than from traditional banks, although not nearly as high as with online lenders or credit cards which are frequently used by business owners as a way to raise needed capital. 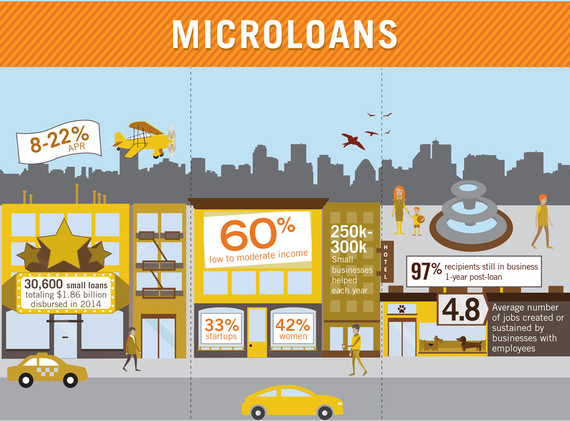 APRs from microlenders usually range from 8 - 22% based on business experience, cash flow, and credit. Payments are usually made in fixed monthly installments, allowing the business to plan accordingly by factoring the payments into their operating budget. According to the 2013 microTracker study that we participated in, conducted by the Aspen Institute, three-quarters of Accion's borrowers got money to help grow their businesses or improve operations, and a year later, virtually all of the recipients--97%--are still in business. When it comes to financing, most small business owners would agree that having such a wide and growing range of options is a vast improvement over the days when banks were the only ones holding the purse strings. However, with so many variables, it's more important than ever to analyze all the available alternatives and figure out which works best for your business. Horacio Ceballas still has mixed feelings about his experience. "The impact of this loan was interesting," he said. "It really added fuel to my business and we weren't in a position of struggling to pay bills on time. That being said, at the end of the year we went to see what our profit was and realized the loan took it all. We had financial solvency and peace of mind, but by the end of the year, we had paid $8,000 in fees and interest. Had we not taken the loan from CAN Capital, we would have had that in profit."